"Cult classic" is a term often thrown around haphazardly, but the true definition can be summed up in five words: "The Rocky Horror Picture Show." Chronicling the adventure of an engaged couple at a bizarre convention after their car breaks down, the film premiered in theaters Aug. 15, 1975. Forty years later, as part of Entertainment Weekly's special-edition reunions issue, the cast reunited to discuss the movie's impact with NBC News' Joe Fryer. It was a "Time Warp" of sorts for actors Barry Bostwick and Susan Sarandon, who played the engaged Brad and Janet; Meat Loaf and Patricia Quinn, who portrayed Eddie and Magenta, respectively; and Tim Curry, who unleashed mad scientist Dr. Frank-N-Furter on an unsuspecting public. "Did you ever learn the 'Time Warp'?" asked Bostwick, referring to the dance that accompanied the song of the same name. Replied the Academy Award-winning Sarandon, "Absolutely. I've had to do it on numerous occasions." For the uninitiated, Curry noted, "It's just a jump to the left. And a step to the right." Prodded Sarandon, "Yes, and then?" Meat Loaf chimed in with, "Put your hands on your hips. You bring your knees in —"
"— knees in tight, " Curry concluded. After Quinn narrated a few more dance moves, Curry implored, "Once more, in the key of M."
In the movie, the song transitions into Curry's jaw-dropping entrance as the "sweet transvestite transsexual from Transylvania." Nominated for a Drama Desk Award in 1975 for his performance in the theatrical production that inspired the movie, Curry said he was surprised how American audiences reacted to the role. 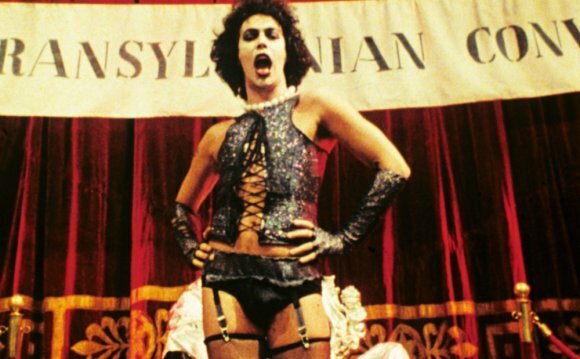 Originally planning to play Frank-N-Furter as German, Curry changed his mind after a chance encounter. "One day I was on a London bus, " he recalled, "and I heard a woman say, 'Do you have a house in town or a house in the country?' And I thought, 'That's it. That's what he should sound like: the queen.'" Meat Loaf, who would go on to win a Grammy Award as a solo artist in 1994, also appeared in that "Rocky Horror" stage production. "I weighed about 315 pounds, I had on a garter belt with fishnet stockings and high-heel shoes, " he recalled. Sarandon and Bostwick joined the cast when "Rocky Horror" jumped to the big screen. And while fans would find the final product fun, filming conditions were less than ideal. "I got pneumonia, " recalled Sarandon, who won a lead-actress Oscar in 1996 for her "Dead Man Walking" performance. "The house itself had been used for other classic horror films, but they hadn't put the roof back on. That was leaking and open. And it was December, January. It was winter." Early box office results were nearly as cold, but found slow and steady heat when the film was screened in smaller theaters. That's when it became a Saturday-night destination, on its way to becoming the longest-running theatrical release in movie history. "But the fans keep getting younger and younger, " Bostwick noted. One of the film's major themes revolves around a few key lyrics. "The thing that resonated for me more than anything was, 'Don't dream it, be it, ' which was a really good idea, " Curry said. "Really good slogan." Added Sarandon, "I've had so many people come up to me and say that film helped them through a dark time." Entertainment Weekly, which is celebrating its own milestone anniversary — No. 25 — this year, will release its reunions issue this Friday.